Quattrolifts is proud to introduce their latest machine the Vector 1800. To meet the challenge of handling heavier and bigger loads a greater investment in machinery is called for. This investment needs to be justified commercially and that is why the Vector 1800 is designed with versatility in mind. 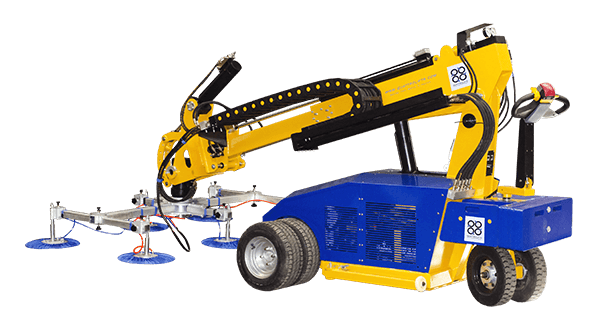 It can handle loads of 800kg (1800 Lbs), reach heights of 4.3 meters (170″) (600kg (1320 Lbs) at full extension), operate in the horizontal and vertical plane and with six large 450mm (18″) profile wheels it can handle most terrains. The Vector 1800 can also be fitted with remote control and variable speed actuators, allowing for precision control. The large profile wheels and the ability to change the lifting head to a hook or a winch means the Vector 1800 has the muscle and the versatility to handle the most challenging jobs.